1. Don’t run the fan when it is raining and the relative humidity (RH) is 100%. As a general rule, turn the fan on if (a) it is not raining and the RH is less than 80% and (b) air temperature is less than the canola temperature. 2. 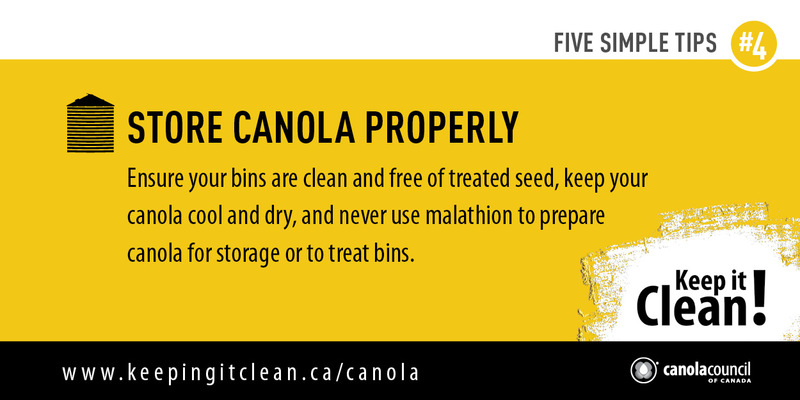 Cooling canola is critical to ensure the seed stays at a safe-to-store condition. 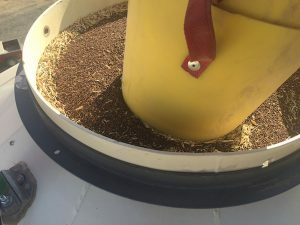 Cool air will more rapidly reduce the temperature in a bin…therefore if cooling hot canola is the goal, consider turning off the fans during hot days. Whether or not to run aeration fans depends on many factors, including air temp, air RH, grain moisture content and grain temperature. When in doubt, run the fans to cool the grain. The chart below from PAMI shows water holding capacity of air based on temperature. 4. Further to point 3, note that very little moisture movement or removal occurs when the air and grain temperature drop below approximately 5°C. So if the canola goes into the bin at 15°C and tough (let’s say 12%), cooling it to 5°C will certainly pull out some moisture, but may only take it to 11%. Cooling it further will help reduce the risk of spoilage, but it’s unlikely to dry it much more. Now the producer may have to deal with cold (still tough) canola in the spring. At that point, the best thing to do would be to sell it as-is (as quickly as possible) or run it through a heated air dryer. Because putting warm air through cool grain is very likely to result in condensation in the bin. 5. Very tough or damp canola will have increased storage risk and probably should be dried with heated air. Storing tough canola very cold can reduce the risk, but the risk is still higher than it would be for canola stored at 8% moisture. 6. Airflow rate is key for aeration and natural air drying of canola. A bin of canola generates a high static pressure (or resistance to airflow) which results in a lower airflow rate from the fan. For temperature conditioning, you need 0.1 to 0.2 cfm/bu. To efficiently remove moisture from the seed you need 0.75 to 1.5 cfm/bu. The old rule of thumb to have 1 hp of fan power per 1,000 bu is misleading, particularly for the larger bins that are more common today. 7. Larger bins that are filled over a few-day period due to intermittent harvesting in less than ideal conditions will have areas of various moisture levels and temperatures. Don’t wait until the bin is full to turn on the fans. 8. On cool days, take a load or two out of bins and leave them on trucks overnight. This will help cool the bin and the turning activity of removing the central core of grain can help reduce spoilage risk. 9. 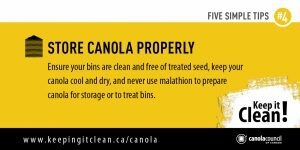 Always remember to Keep It Clean by avoiding the use of malathion prior to storing canola. *Thank you to Joy Agnew with PAMI for her contributions to this article.